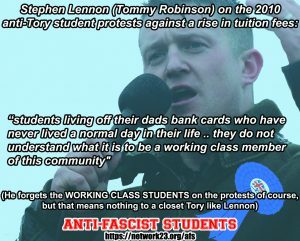 It is hardly a secret that if you scratch beneath the surface of the likes of Stephen Lennon (Tommy Robinson) and Co., you find a Tory hiding there. Here is a reminder to those of you who have forgotten. When it comes down to it, we all know which side they are really on and it certainly is not the side of the working class!